What is the MSCO Energy Savings Agreement? You may have heard it said that an ounce of prevention is worth a pound of cure. We see this all the time when it comes to HVAC maintenance. Over the lifespan of your HVAC unit, routine maintenance not only saves you the headache of more frequent (and inconvenient) repairs, but it actually will save you money in the long run. 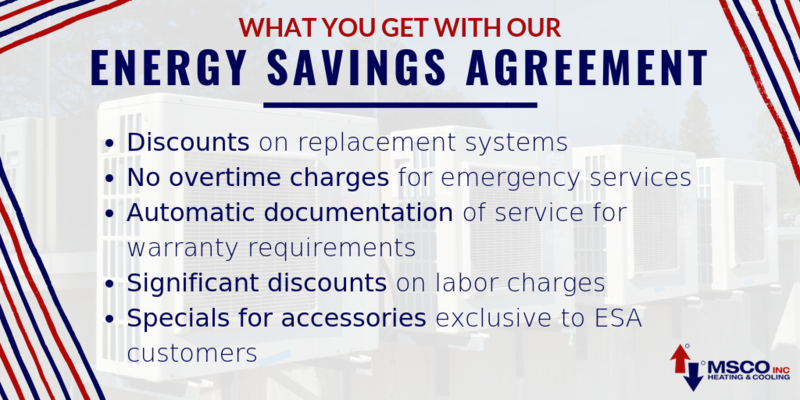 Our Energy Savings Agreement (ESA) is a comprehensive preventive maintenance program that we’ve specifically designed to extend the life of your HVAC system. The purpose of our ESA is to reduce operating costs while identifying potential failures through routine inspections including during non-peak periods. Now, because we keep your equipment cleaner, the system’s reliability and efficiency increases, maximizing air quality and lowering operating costs. We identify potential issues during routine maintenance so repairs are complete before severe weather conditions or shortages of repair parts. The routine maintenance we provide is not only of benefit to you, but it is an integral part of our company’s service structure. All of our technicians go through our carefully designed training program as well as year-round employment (we never need to “shake off the rust”). We are always recruiting, training, and retaining a high quality, professional workforce that you can trust in your home. But in addition to our training program, our ESA customers provide our technicians first-hand experience identifying and monitoring our customers’ HVAC systems, allowing them to recognize proper operation versus a system that’s not running optimally. This allows our employees to become more familiar with all the equipment we install by increased frequency of operation. And, since most repairs are discovered during maintenance, employees have work even during non-peak periods. If you would like to know more about our Energy Savings Agreement, let’s chat! We are dedicated to saving you time, headache, and of course, money. Let’s see how we can help you!